"Mommy? Do you think it's going to rain?" "Oh, no. It already did. Besides, those clouds are really far away. We'll be fine." Famous. Last. Words. 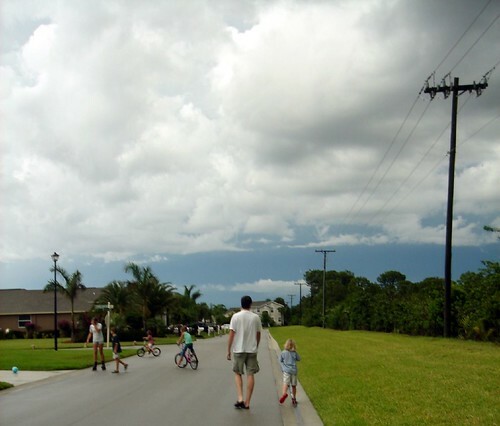 We walked another 60 feet or so, getting us a good 3/4 mile from home, and the skies let loose. At first we ran, but after about 2 seconds we were struck by the realization that we had a long way to go, it was raining hard, there was no shelter, and we were already soaked. Sigh ... so we took our time and had a good laugh. Seriously, there are supposed to be 17 houses in our community heading to or in foreclosure, and others for sale ... and yet on our journey home we didn't pass a single house without a car in the driveway. A little borrowed shelter too much to ask for? Tuesday night the girls cornered me and Jason and asked for help with redecorating/rehabilitating their dollhouse. 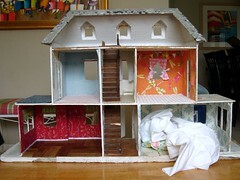 I bought this dollhouse at a garage sale years ago because I wanted to eBay the furniture that was in it. I sold the furniture and people (all old Little People), fixed up the dollhouse, and gave it to C. I'm pretty sure that all happened before the siblings came along. Now, four other little helpers later, the house is in a sad state of disrepair. Roof tiles are falling off, wallpaper and carpeting is coming out, the stairway rails are missing, much of the furniture is gone, and it just needs a lot of TLC. C. and M. now share the house, C.s' idea as she's outgrown playing with dolls but still loves the house. The house isn't small, the ceilings on each of the first two floors are 9" tall and it's at least 40" wide. 1:12 scale (or 12:1 ...no I think it's the first). M. picked the fabric for the kitchen and girls bedroom and I put it in for her. Yes, the girls bedroom is the biggest bedroom ... there are four girls ... and one boy, but apparently he's getting the living room couch. The kitchen is reddish pink floral with green pleated valances. The glossy baseboards and crown molding are made from satin ribbon. And, yes, of course I made sure the view from the kitchen windows coordinated with the interior (not ... it's just a bench I made from an old patio table and lives in the living room to provide enough seating for everyone). The girls bedroom is a heavier orange dragonfly fabric. Heavier fabric was much be tter. It held it's shape and covered the flaws in the walls much more easily. The curtains were already with the dollhouse, from the old nursery that will now be the parents bedroom ... they are hung on a cocktail straw with the ends smashed into two beads. The floor is white soft minky. On the back wall is a hung string of banners, just to add some more color and fun to the room. The mirror on the side was I. "found" when the old wallpaper came down. It doesn't come off and I had just covered over it last time. I might have done that again but I. worked really hard to get it clean and shiny with a Magic Eraser, so it's now a very important feature ... and it's good, because four girls will need a mirror in their room. Interestingly, this house has no bathroom. I suggested making one behind the first floor stairs, but that was met with "oooohhh gross! ", as if having no bathroom is any less gross. Geez. Oh, I came across this doll quilt today. Isn't it wonderful? I can't wait to try to make something similar. I love the doll house! It has inspired me to get one for the boys. What a great family project. Very inspiring! We bought Sprout a dollhouse from a thrift store for Christmas - nice "bones" but needs a little interior design work.